Biography of American Impressionist Painter. An early exponent of American Impressionism, Theodore Robinson made a number of visits to France, between the years 1876 and 1892, and became a close friend of Claude Monet, whom he visited at Giverny. Paradoxically, despite his willingness to explore a new type of modern art, his particular style of Impressionism was relatively conservative. Even so, several of his paintings are considered to be masterpieces of American art in the Impressionist style. Best known for his landscape painting, he was also noted for his genre painting of village and farm life, as well as his Connecticut boat scenes. His famous works include: By the River (1887, Private Collection), La Vachere (1888, Smithsonian American Art Museum), La Debacle (1892, Scripps College, Claremont) and Union Square (1895, New Britain Museum of American Art, Conn). Shortly before his premature death from an acute asthma attack, he wrote in-depth articles on the Barbizon painter Camille Corot (1796-1875) and his friend Claude Monet (1840-1926). Other exponents of Impressionism in America included: Whistler (18341903), also called a tonalist; Mary Cassatt (1845-1926), William Merritt Chase (1849-1916), John Singer Sargent (1856-1925), John H Twachtman (1853-1902), J. Alden Weir (1852-1919), and Childe Hassam (1859-1935). One of the most admired of the American Impressionist painters, Robinson is often described (like several others) as the earliest American convert to the movement. This title is false: Robinson became involved with Impressionism at the end of the 1880s, at very much the same time as his fellow artists and friends, John Twachtman, J Alden Weir and Childe Hassam, making it difficult to account for the suggestion of his precedence. It may be due to his early demise, lending not only a tragic aura to an attractive figure and very able artist but cutting him off with so brief an Impressionist career. Since he did not live to see the establishment of the organization of "The Ten American Painters," critics may have thought he adopted the Impressionistic mode before his colleagues who were involved with that Impressionist-oriented group. As with many short-lived figures in the history of art, writers have speculated on the nature of Robinson's art had he lived beyond his mid-40s. Yet, it seems unlikely that his style would have evolved in a radically different direction than it had taken. That possibility may have been raised, however, because of inconsistencies which critics have always recognized in his work, a dichotomy usually defined as French-inspired Impressionism and American Realism. There may have existed a dichotomy, but that was not it. Despite the recognized inconsistencies in his work, Robinson has remained, with John Twachtman, one of the two continually admired figures of the American Impressionist movement. Two major museum retrospectives and deeply appreciative studies accompanying the shows at The Brooklyn Museum in 1946 and The Baltimore Museum of Art in 1973 testify to this. In addition, his diaries of the last four years of his life, deposited in the Reference Library of the Frick Museum, in New York City, delightfully reveal an alert, modest and very admirable figure. For how it began, see: Impressionism: Origins and Influences. For details of the painters, see: Impressionism: Early History. Robinson was born in Irasburg, Vermont, and his return there at the end of his life indicates a "sense of place" which might otherwise seem masked by his peripatetic course during his years as an artist. The family moved to Illinois and then Wisconsin when he was a small boy, and he later studied art in Chicago. In 1874 he continued his art training in New York City, for two years at the National Academy of Design and then as one of the first students at the newly formed Art Students' League. At this time he is known to have called upon Winslow Homer (1836-1910), and Homer's bucolic images of farm hands in rustic settings saturated in vivid if still tonal light of the mid-1870s are not unrelated in subject and style to Robinson's figurative images painted later in his career. In 1876 Robinson went to Paris where he studied first with Carolus-Duran (1838-1917). He may have learned there to appreciate the bolder, more painterly manner that Carolus practiced and imparted to many of his students such as the portraitist John Singer Sargent (1856-1925), but Robinson transferred to the Ecole des Beaux-Arts and the atelier of Jean-Leon Gerome (1824-1904), the most famous master of academic art, with whom the greatest number of Americans studied. At this time, Robinson seems to have evinced no interest in the new and controversial Impressionist movement; a summer spent outside of Paris at the artists' colony in Grez in 1877 may have had a greater impact upon his work. (See: the Glasgow School of Painting.) Many American and British artists and writers were there during the late seventies and eighties, including the American painters Willard Metcalf and Will Low (1853-1933), and a large group of Irish and Scottish painters. These artists combined the current interest in plein-air painting with the study of rustic peasant subjects. Robinson's relationship with some of his colleagues there is worthy of further study in terms of direct, or perhaps indirect, influence; in particular, some of his figure painting, in subject and in colour, are quite similar to the works of the outstanding Irish painter Frank O'Meara (1853-88). (See also: John Lavery (1856-1941) leader of the Glasgow Boys.) 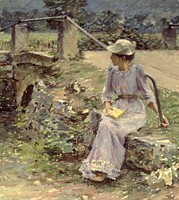 O'Meara and other British and Irish artists combined academic concerns with an interest in outdoor phenomena of light and atmosphere, a pursuit which came to centre upon Jules Bastien-Lepage (1848-84) and his painting, but Bastien's contact with the artists of the Grez colony occurred in the early 1880s, after Robinson had left. Nevertheless both Marsden Hartley (1877-1943) and Frederic Fairchild Sherman (1874-1940) were to liken Robinson's later work to that of Bastien. In 1877, Robinson's painting of A Young Girl (now lost) was shown at the Paris Salon, and the following year his work was exhibited at the first exhibition of the Society of American Artists in New York; he was thus identified with the more progressive, and foreign-influenced, younger painters even before he returned late in 1879. He must have visited Venice briefly just prior to leaving Europe, for there is a small work by Whistler inscribed to Robinson when they were both in Venice, and Whistler only arrived in September of that year. Back in this country, Robinson was occupied in a variety of ways. He worked in magazine illustration for Harper's Young People; Will Low helped secure him a teaching position, and he became involved with the surge of interest in various types of decorative art, notably mosaics and stained glass art. He enjoyed contacts with the members of the Society of American Artists, and spent the summer of 1882 on Nantucket Island with Abbott Thayer (1849-1921). His own painting continued in the tradition of rustic scenes, and Robinson was to remain an admirer of the work of American Realist artists such as the portraitist Thomas Eakins (1844-1916) and also the genre painter Winslow Homer (1836-1910). In 1884, Robinson returned to Paris where he remained more or less for eight years, despite frequent short visits back to America. It was during this period that he turned to a more Impressionistic aesthetic, coinciding with the development of his friendship with Monet. The exact course of Robinson's development prior to his Impressionist "conversion" is, however, difficult to ascertain. As we have seen, he was subject to a multitude of influences and artistic relationships, but relatively few significant works painted before 1888 are known. A number of major paintings of his first years back in Paris suggest an interest in individual craftsmen and their trades, such as the Cobbler of Old Paris of 1885 and the Apprentice Blacksmith of 1886. These are still dark, tonal paintings, set in sharply delimited interiors. In 1887, not long after the last of the Impressionist Exhibitions in Paris, Robinson went out to Giverny for the first time. It was there that Monet had settled in 1883, and it was to Giverny that young artists and art students began to travel, to paint in the shadow of Monet. Robinson was not the first American to go there; a number had visited there early on, painters who were later to be identified with the Impressionist movement such as Willard Metcalf (1853-1925). John Leslie Breck (186099) and Theodore Wendel (1859-1932) were also among those who had preceded Robinson. Breck had studied in Leipzig, Munich and Antwerp before returning to America in 1883. He spent the next two years in Boston, but in 1886 returned to Europe, this time to France, where he studied at the Academie Julian in Paris and spent his summers in Giverny, until in 1890 he returned home to stay for the remainder of his short life, with the exception of a trip to England in 1891. A portrait by Breck of Monet's step-daughter Blanche is known, but most of the few paintings by this still little-studied artist have come to light are small, intimate patches of flowering gardens rendered in blazing colour which is broadly applied in an Impressionist manner. It was very probably a group of such pictures shown back in Boston by Lilla Cabot Perry in the late 1880s which hastened the acquaintance with the new aesthetic among her young artist colleagues such as Dennis Bunker (1861-90), and it may be significant that Bunker's Chrysanthemums of 1888, a relatively early Impressionist work for him, is quite close in subject and style to Breck's pictures. Hamlin Garland (1860-1940), in his Roadside Meetings, commented on the group of Breck's paintings in Perry's studio, with their blazing, primitive colours and their very European look. Theodore Wendel (1859-1932) was a Cincinnati artist who studied there at the School of Design before departing in the late 1870s for Munich, following the course of many Cincinnati painters. He became one of the "Duveneck boys" but as with a number of Munich-trained Cincinnatians - John Twachtman is another - Wendel went to Paris in the mid-eighties. He studied at the Academie Julian, but his first summer in France in 1886 was spent in Giverny, where he adopted a higher-keyed chromatic range and a greater interest in light and atmosphere. His early Giverny subject matter remained rustic - peasants, farms and haystacks - and perhaps more in the manner of Camille Pissarro (1830-1903) than Monet, though the traditional rustic significance of the haystacks of Monet's great series should not be overlooked. Wendel returned to America in 1888, teaching in Boston at the Cowles school, and joined with Robinson in a significant two-man exhibition at Williams and Everett Gallery in 1892, a major presentation of Impressionist painting in Boston. In 1899, Wendel settled in Ipswich, Massachusetts, where he continued to practice his modified Impressionism, often painting his adopted town in a manner recalling the compositions of the Parisian scenes of Renoir (1841-1919) and Pissarro. In the summer of 1888 Robinson returned to Giverny, and this time settled there next door to Monet with whom he became an intimate friend, though Monet was never Robinson's teacher. Monet however offered the young American much advice and encouragement, and it was in 1888 that Robinson adopted many of the aesthetics of Impressionism. This can be seen in such works as La Vachere (c.1888, Smithsonian American Art Museum), a monumental presentation of a peasant cow-girl. The subject is not an unusual one; in fact, it should be recognized as part of a popular tradition of life-size peasant figures, stemming from the peasant art of Jean-Francois Millet (1814-75), and then monumentalized by followers like Jules Breton and Bastien-Lepage. What is unusual in Robinson's painting is a Salon-size subject interpreted in an Impressionist manner: a figure partially dissolved in broken brushwork, and greater chromatic variation and brilliance. Altogether the possibilities are very great for the moderns, but they must draw without ceasing or they will get left, and with the brilliancy and light of real outdoors, combine the austerity, the sobriety, that has always characterized good painting. The combination of outdoor light (and radiance) with sober academic drawing may, indeed, have led Robinson and other ambitious young Americans toward inconsistent and inconclusive paintings, but neither concern stems from a nativist tradition or native training. Robinson's colour was never the brilliant chromatic range of Monet; it was, in fact, closer to the more somber and muted tones of Pissarro, himself closer to the naturalism of Millet. Robinson preferred a limited colour range that emphasized bluish purple tones and a range of greens. Much of Robinson's Impressionist landscape painting has an obvious geometric structuring, based upon a series of dominant, parallel diagonals which are determined by the viewpoint selected, the placement of the forms of buildings and other elements in the landscape, and echoed by the repeated diagonal direction of the broken brushwork. A kinship with the work of Paul Cezanne (1839-1906) is suggested here, but a connection between the two artists is so far unrecorded. Many of these qualities continued in his finest French works, such as La Debacle (1892, Scripps College, Claremont), The Watering Pots (1890) and The Layette (1892). Many such figure paintings involve the image of his favourite models, Josephine Trognon and a young woman named Marie. Another quality found in many of Robinson's finest pictures is the high horizon line, distinguishing his work from that of his mentor Monet, but typical of the innovations of Bastien-Lepage. The high horizon seals off the top of the picture, forcing the work to be read vertically. It also tends to flatten the composition despite the panoramic nature of some of Robinson's masterworks - another dichotomy in his art. In emphasizing the picture plane and the intrinsic nature of the paint upon a basically flat surface, Robinson was sharing an innovative aesthetic approach with his American colleague John Twachtman, who was also adopting the high horizon at the same time, but back in America. Robinson returned to New York late in 1888 and showed his first Impressionist works at the Society of American Artists in 1889, where he was quickly recognized as a leader of the more progressive school. He continued to make brief returns during his Giverny years, exhibiting here and in 1890 winning at the Society the Webb prize for the finest landscape by an American under forty years of age. He won the Shaw prize for figure painting at the Society in 1892. Robinson has been noted as being one of the American painters most influenced by and receptive to photography. A number of his finest and most interesting paintings are based at least in part upon surviving photographs, for example his Two in a Boat (1891), where not only the basic composition - itself preserving his preference for strong structure and diagonals - but even the close tonalities are quite similar to a surviving photograph, although Robinson has altered the view by eliminating a distracting second featured boat. In other paintings based upon photographs, blurred areas of form and washed out, light-struck areas are preserved, harmonizing generalized features and forms with his manner of broken brushwork. Robinson used photography primarily for his figure drawing, not only for its aesthetic contribution but for very practical considerations; it saved on the cost of models, though he would utilize both models and photographs for the same painting. Robinson continued to show Monet his works, and relied to a degree upon Monet's comments and criticism. Robinson's Road by the Mill (1892) was criticized by Monet who liked the painting but found the values rather equal. Robinson adapted some of Monet's subjects also, such as the master's preferences of haystacks and rows of poplar trees. Robinson's handling of these and other themes associated with Monet, however, is quite distinct, usually employing a more limited and muted palette and a more structured, less decorative composition. Robinson saw Monet's series of Rouen Cathedral soon after his return to Giverny from New York in May of 1892. He admired them enormously, the grey-day ones more than those of brilliant sunlight, which he agreed with Monet had the air of Venice or Sicily. Robinson was impressed by their grandeur and it led him to begin his own mini-series, a group of three views of the Valley of the Seine, that year: one in sunlight, one somewhat overcast, and one on a grey day. As with Robinson's estimation of Monet's series, Monet preferred Robinson's scene set in a grey atmosphere. Robinson had at first planned only two pictures, beginning with a view in full sunlight and then a clouded one, and later adding a third with floating shadows. Robinson's series, concerned with changing conditions of light and weather depicted from the same spot and of the same topography, is his closest approach to the temporal aspect of Monet's painting, but it is significant that he has deliberately altered or even reversed Monet's treatment of the subject in the latter's impressive series. Robinson's paintings also centre upon a church, the steeple of which rises above the distant view of the town of Vernon, a city near Giverny on the Paris-Rouen railroad, and Robinson's diary mentions including the church, almost certainly therefore as a subtle homage to Monet, though the significance of the ecclesiastical structure to both artists should not be overlooked. But Robinson also emphasized the panoramic nature of his work. This contrast with Monet's up-close view of a monumental structure is quite deliberate. Another major canvas of Robinson's is The Wedding March (1892), commemorating the summer wedding of Monet's step-daughter, Suzanne Hoschede-Monet, to the American artist resident in Giverny, Theodore Butler. This is a rare subject picture for Robinson, though the glaring summer light and the blurred vision of forms moving quickly down the road, one of them seen only through veiling, must have been appealing to the artist-friend of the bride and groom. The same year also saw the publication in the Century magazine of Robinson's article on Monet. This was Robinson's last summer in Giverny, however, and the following winter he returned to America for good. Back in this country, Robinson, always unsure of himself, became increasingly self-mistrustful. He wrote in his diary: "I should aim for more vitality. I have a horrible fear that my work pleases women and sentimental people too much. I should do more important pictures. I should paint local scenery at home, even if it is ugly as it may appear to some." He was conscious that his European pictures sold better than his American ones, though this was based on a preference for foreign scenery, not a discrepancy in style. Robinson lived in New York, painting the regions around the metropolis. He did pictures in Greenwich while visiting nearby with Twachtman. Other pictures were painted elsewhere during summers that he spent teaching, for example, his Port Ben, Delaware and Hudson Canal (1893) at Napanoch, New York, while teaching for the Brooklyn Art School. The work was a controversial one, rejected by the Metropolitan Museum of Art after Robinson's death when it was offered to the Museum by a group of his friends. A corollary to the traditional interpretation of Robinson as an artist torn between nativist and foreign tendencies has been that he returned to more Realistic painting after he left France. Port Ben - and others among his best work - testify to the inaccuracy of this for the picture is even more colourful and light-filled than his Giverny paintings. The critics were responding to his art; Roger Riordan in The Art Amateur for December, 1892, praised the "sparkle and animation" in his work. But if the foreign technique was now admired, the Impressionism of Robinson and others drew another form of criticism. Even so vigorous a champion of Impressionism and an admirer of Robinson as Hamlin Garland felt that the artist's subjects were unworthy of his skill and study, that an artist should have more than a seeing eye and a sensitive hand, and that his work should have a relationship to sentiment. This was Garland's ultimate response to Robinson's work, with which he may have first become acquainted at the Chicago Columbian Exposition in 1893, where the artist exhibited three works, including The Layette, and where he painted a brilliantly coloured rendition of the fair. Several of Robinson's most beautiful pictures were painted at Cos Cob, Connecticut in June of 1894, concerning which critics have noted a new austerity and a strong sense of abstract, geometric design, based upon the construction and rigging of boats and the linear docks. These reflect his own new appreciation for Japanese art and even his acquisition of a Japanese print, from which he purposefully aimed to draw a new refinement and precision. Robinson continued to teach, in the summer of 1894 at Evelyn College in Princeton, and at Brielle, New Jersey. He also taught at the Pennsylvania Academy that fall. In 1895 he had an exhibition in New York at the Macbeth Gallery, which then travelled to Atlanta, St. Louis, Fort Wayne and Cincinnati. The critics reacted favourably to the show, characterizing it as realism with Impressionist overtones, but, like Garland, decried the lack of sentiment and imagination. In the winter of 1894-95 Robinson turned to the painting of urban views, following the lead of his fellow-Impressionist Childe Hassam and even of such Tonalist painters as Birge Harrison (1854-1929), and in the manner of his French Impressionist colleagues. Such a subject as Union Square - perennially a favourite of artists including Robinson's friend and colleague J. Alden Weir - allowed Robinson to explore the momentary effects of falling snow and changing atmosphere, in combination with solid drawing and the rendition of architectural structure - see: Union Square (1895, New Britain Museum of American Art). In May of 1895, Robinson painted at Haverstraw, New York, another series of three similar views - in sunlight, in fog, and in sunlight through fog - works closer to his French landscape series in their exploration of changing temporal conditions. That summer he returned to his native Vermont, bringing an art class to Townsend, under the supervision of his cousin, Agnes Cheney. Her daughter, Alice, posed for him though he utilized photographs also. One of these pictures showed her in a hammock, a not infrequent device for artists of the period; Robinson himself had painted a similar work at Princeton the previous autumn. Hammocks not only were associated with the outdoors and reinforced a mood of informal leisure, but, just as the veils with which many artists of the period experimented, the hammock material allowed light and air to pass through it, a fabric itself almost in dissolution. Robinson felt that he had found his place in America by returning to Vermont, and he planned to continue painting there, perhaps even during the winters as well as summers. He began a series of views of the West River Valley in Vermont, emphasizing the effects of cloud shadows on the land, but completed only one of them. He also wanted to incorporate qualities of Vermeer into his art, writing more and more about his love of Vermeer's homely detail, but his career was brought to a halt by his death from acute asthma in April of the following year, 1896. Robinson was reserved in his judgment of his fellow Impressionists. He admired Twachtman's painting and wanted to capture some of its qualities, and perhaps it is not surprising that the two shared later critical esteem more than most of their contemporaries. He found Weir artistic, but decried his bad drawing. He viewed some of the early works of the young Ernest Lawson (1873-1939), and found them not very personal and not delicate, but he later amended his judgment, admiring their refreshing, primitive rudeness. He thought Metcalf's and Hassam's work clever, but judged the latter "a tinsel sort of art." His own was not. Robinson's path was more rocky than Hassam's, but his achievement was a sound one, and he produced some of the most beautiful works of the Impressionist movement though, like the artist himself, they are modest and unassuming. Paintings by Theodore Robinson can be seen in many of the best art museums in America, including the Metropolitan Museum of Art in New York; the Smithsonian American Art Museum and the Corcoran Gallery of Art, in Washington DC; and the Art Institute of Chicago. We gratefully acknowledge the use of material from the exhibition catalogue American Impressionism (1980, Henry Art Gallery).  For biographies of other 19th century Impressionists in America, see: Famous Painters.  For more details of Impressionism in the United States, see: Homepage.